I ran into this lovely print by Studio Mela this evening and it resonated with me. 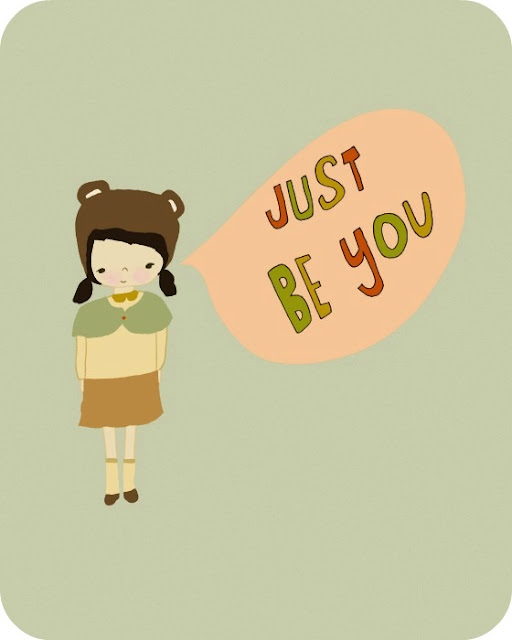 The sentiment is so simple, "just be you", but some days it is so easy to forget. It seems we all have many roles to fill. Thank goodness we get to make lots of mistakes. Here's to letting all the pressure go and focus on being ourselves. p.s. I watched the Harry Potter movies for the very first time this week. I've been avoiding them for years. I will say this, they were the perfect break from unpacking and I was hooked by the time we got into the 5th movie. Also, Bono Baby can't stand Death Eaters. Kat, you always seem to find great art with a subject that looks like you. I agree with that sentiment whole-heartedly. I have found that people seem to like me when I act like myself and don't worry about what other people think (or my perception of what they think). Thanks for being you Kat, I think you are great at it and I love you for it. Hope you're feeling good in every way--pregnancy can take such a toll on it all sometimes! i can't stand them either! creepy buggers.